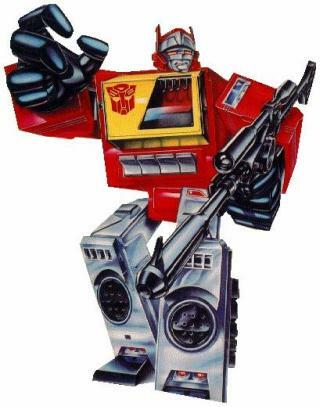 Blaster is unique among his Autobot brethren in that he not only has an alternate form, but he also has several companions at his disposal. He may transform into a digital radio recorder/receiver and has employed up to four smaller character-scaled Transformers as a means of both espionage and defense: Steeljaw, Ramhorn, Rewind and Eject. While Rewind and Eject are similar in appearance and talents, Steeljaw and Ramhorn are more beast like in their capabilities. In his alternate form, Blaster is able to directly interface with all computer and security interfaces, gaining +1D+2 to all applicable Tech rolls.